Hot pink cover aside, James Hughes' book, Altered States: Creativity Under The Influence, is one of the most visually attractive books in print. It certainly deserves coffee table status, but don't be fooled. Altered States contains much more than just pretty pictures. 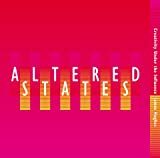 Altered States is full of descriptive, thought-provoking, inventive text-- text that has been thoroughly researched, and is decidedly well-crafted. Dismay became delight when it became clear that the book's title is a bit misleading. While it does delve into issues surrounding creativity under the influence of alcohol and drugs, "influence" is defined as any state of mind through which creative energy can flow or flourish-- dream states, epileptic seizure, manic depression, madness, shamanism, music, ritual, meditation, genius, even childhood. Altered States achieves a delightful balance-- it dedicates neither too much, nor too little, text to any given subject in the book. Each subject is explored with enough depth to foster a solid understanding of it, but not so much as to be exhaustive. Quite the contrary-- I found myself taking notes on details that intrigued me, things I will explore in more detail on my own. What was Lewis Carroll's fascination with little girls? Why did Dionysus get such a bad rap? How did Helen Keller break out of her body's prison? Aeschylus was gay? How will information technology affect creativity? What kind of man would paint the graphic, sexually antagonistic, Judith and Holofernes? The artwork of this fine book includes Egon Schiele's painting, The Embrace; a 1929 photograph of Picasso in his studio; a beautifully rendered image of a handwritten page from Dostoyevsky's notebooks; a photo of A.A. Milne with young Christopher on his lap; a black and white of Bobby Fischer peering over a chess board; and a depiction of an ancient wooden Inuit mask. Even a student of fine arts will discover at least one piece of art that she has never encountered before-- a number of pieces, most likely. Altered States is an absolute treasure that will enrich personal libraries for years to come. It will act as an impetus for a great many conversations amongst creatives and intellectuals alike. It can be read cover-to-cover, or skimmed randomly whenever the mood strikes. Altered States is an exciting journey through the history, philosophy, and experience of high creativity.